These luscious products will keep your lips smooth and moisturized during the warm summer months. To a heat-safe pan, add the Shea Butter, Cupuacu Butter and 2 oz. Castor Oil. On low heat, melt until completely liquid. Add 1 ml Vitamin E and 2 ml Pineapple Colada Flavor Oil to the melted butters. Add two 0.15 ml scoops of the Yellow Mica Powder to the melted butters and stir until evenly dispersed. Set aside while you make the Lip Scrub. In a bowl, measure 6 oz. of granulated sugar. Add the 1 oz. Mid Chain Triglycerides Liquid and 1 oz. Castor Oil. Stir until sugar is evenly coated in oil. Add 1 ml Vitamin E and 4 ml Limeade Sweetened Flavor Oil and stir. Stir in 1 scoop of Blue Mica Powder and 2 scoops of the Yellow Mica Powder. Fill 10 of the jars with the sugar scrub. Apply Press & Seal Liners to jars. Since this is a product being placed on the lips, we recommend using the sealers to prevent tampering. If your Lip Butter has not yet started to thicken, place the container in either refrigerator or freezer for a few minutes. When the oils and butters come to a semi-solid consistency, use a hand mixer to whip to a fluffy cream-like texture. Carefully scoop into the remaining 10 jars and allow to come to room temperature before adding the Press & Seal Liner and capping. This butter will harden once it comes to room temperature and will not stay fluffy and soft. However, it will easily melt with body temperature. Package one of each product into a cello bag and tie with raffia. 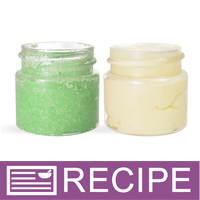 TO USE: First apply a small amount of Lime Margarita Lip Scrub to your lip and gently massage to exfoliate. Wipe off with a tissue or cloth. Finish with the Pina Colada Lip Butter to moisturize. NOTE: It is not recommended to leave this in a purse or car during warm weather. Ingredient Label: SCRUB: Sugar, Castor Oil, Medium Chain Triglycerides, Fragrance, Vitamin E, Mica, Titanium Dioxide, Blue 1, Mica, Titanium Dioxide, Iron Oxide. BUTTER: Shea Butter, Cupuacu Butter, Castor Oil, Vitamin E, Fragrance, Mica, Titanium Dioxide, Iron Oxide. "On your lip scrub recipes, some of your recipes have Vit E added, some dont - what is the difference and is the Vit E optional? Some of lip scrubs have butter blend and some are all oils, which is preferable and what is the difference in prroduct ?" Staff Answer Vitamin E is usually added as an anti-oxidant to keep the oils and butters from going rancid. Scrubs made with oils or butters are both moisturizing to the lips. Some recipes use both. It is your personal preference how you want to make them. "Can regular mica be substituted for the oil-locking micas?" Staff Answer Yes, as long as they are approved for lip products. "Can another oil be substituted for the Castor Oil? I know there is a chance of ingestion with this product so I wasn't sure which other oils would work for that. Thanks!" Staff Answer Hi Brittany, Yes you can substitute another base oil for Castor Oil. We have used Jojoba Oil, Safflower Oil, and Sweet Almond Oil in other lip recipes. We have not tested these oils in this particular recipe so make sure you test in a small batch to ensure it comes out to your liking. "What other butters can be used in this recipe?" Staff Answer Hi Tracey, this recipe has been formulated to work with the butters listed. If you would like to try other ones you can. We just recommend to test out in small batches to determine optimal results. You could try using a creamy butter blend for the Shea Butter - Ultra Refined or another hard butter for the Cupuacu Butter such as cocoa butter. "Is the lip butter supposed to have pina colada fragrance oil? Is it not a flavor oil?" Staff Answer Hi Tina, the Pina Colada Fragrance Oil is ok to use in this kit since it has a 100% lip maximum exposure per IFRA.